Q: I struggle with internalization in first person POV. I've read your internalization 101 post. Maybe it's that I don't know my character well enough to get a feel for how she would describe what she sees, feels, hears etc. I don't feel like I'm quite there with her voice and I think big part of it comes down to her thoughts (or lack thereof). A: I’m going to answer this question in two parts (my answer on voice got quite long). 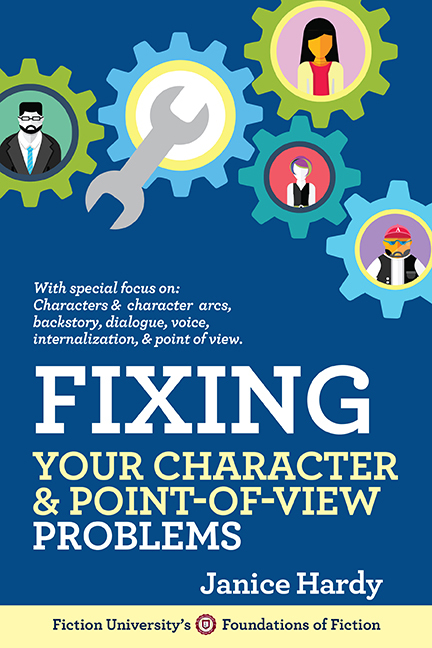 Today I'll talk about developing a character's voice, and next week, I’ll look specifically at writing first person internalization and how it differs from third person. 1. What’s her personality like? How she appears to the world: This is how she sounds to others. How she views herself: This is how she sounds internally. How she wants to appear: This is how she’d sound if she was brave enough to say what she really thinks (or not say if she’s too open about her opinions or feelings). 2. How do you want the character to sound? How the novel’s tone can be reflected or implied by the words and phrases used by the narrator. How the narrator’s view of the world can be the lens the reader sees this world through. The types of thoughts or observations would best support the tone of the novel. 3. Is her inner voice different from her spoken voice? Not every character will hide who they really are, but if she’s the type of person who doesn’t want others to see the real her, her interior voice will reflect the person she’s hiding. 4. What does she think about? The types of things she notices: Think about the things that matter to her and her goals. What will further those goals? Hinder them? What strikes her as out of place or unusual? What she’s afraid of: She’ll notice the things that scare her or make her leery, even if she doesn’t know why. Potential threats draw attention, and may even distract her at the worst possible time. What she admires: She’ll probably remark on traits or aspects of things she admires or appreciates, noticing what’s pretty or soothing, or even attractive. What’s she’s jealous of: She might also spot things, traits, or people that make her jealous in some way. What she needs to know about her surroundings: Different personalities pick up on different details based on what they need to know about a room or location. For example, if she’s prone to panic attacks, she might notice where all the escape routes are. If she prefers to be the center of attention, she might notice the people and how they react to her. What she needs to know about other people: This can hint at how she handles her relationships. Someone who’s had a lot of bad experiences might be distrustful of people, and her thoughts would show her hesitancy and concern. Someone might want to know everyone’s names, or how well they’re dressed to decide who is worth talking to and who isn’t. These are just some of the possibilities, but hopefully they’re enough to give you an idea of what to consider. And remember—not all of these need to be conscious thoughts. Someone just getting over a bad breakup might be wary of anyone who reminds her of her ex, even if she doesn’t realize it. But her thoughts might hint at that wariness or unconscious hostility. 5. How does her thought process work? Some people make snap decisions, others need to examine every possible angle before making a choice. Think about how much time and consideration your narrator needs to make a decision. This will reflect her personality in some way, as someone who’s impulsive likely makes snap decisions, and someone who is thoughtful and deliberate probably takes her time to examine every option. Struggling with internalization could just be a red flag that you haven’t figured out enough about the character to write her yet. Try developing the character and her personality (not physical details) until you feel you know her well enough to capture her voice. Her internalization ought to start flowing naturally then. Do you have any tips for this writer? How do you develop your first-person narrator’s voice? This is a fantastic reference. Thank you! I'm working on a new short story and I'll use these questions to help me get to know the main characters. Looking forward to next week's post also. "What she needs to know about other people" - Very thought provoking. Hadn't really thought about that one. I'm an accountant so year-end is pulling me away from all the things that I REALLY love - like writing, and your blog. This was a nice break and great post as always. Thanks! This is excellent. I'm printing it out so I can read it over and over and write my own ideas as I think about my characters. Thanks! Yes this has been so helpful - brilliant set of questions. I have worked through them and little lightbulbs went off in all directions. Thanks as always for your excellent posts!